With our affordable fees, special discounts and financing, hair transplant cost should no longer be a problem for obtaining Parsa Mohebi Hair Restoration quality hair transplants. Please come to one of our clinics for a free consultation with Dr. Mohebi himself today and experience a new standard in hair restoration field. Don’t accept anything but the best quality of services and techniques. Hair transplant cost has to do with the techniques used in different clinics. Many hair transplant clinics still have not started using microscopes for harvesting grafts. Some hair transplant clinics still use mini- and micro-grafts (big or pluggy transplants that usually leave the patient with a patchy spotted pattern) instead of follicular unit transplant, which is the gold standard in hair restoration industry. Our Standard fee of strip hair transplant is $6 per graft in our Los Angeles offices. This rate will drop to $4 per graft for any grafts after 2500 grafts in large cases. Procedures have a minimum fee of $5000. Call our offices for FUE rates. The pricing for scar revision depends on the location and the size of the scars, which will be discussed at the time of procedure. We may have occasional or seasonal discounts that you can contact our offices for more information on those. 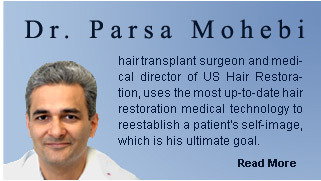 Parsa Mohebi Hair Restoration always strives to make hair restoration procedure as affordable as possible so everyone can use our quality and life changing procedures. We offer a variety of attractive no-interest* and low monthly payment plans. Our financing system works just like a credit card so it’s easy to use over again without having to reapply. For your convenience, if you’re traveling 100 miles or more to our office, Parsa Mohebi Hair Restoration offers a $500 reimbursement off the cost of travel expenses and hotel fees (hotel is preselected by US Hair Restoration). In addition, from the hotel, we’ll provide transportation (free of charge) to and from our office. For those traveling over 50 miles to our office ,Parsa Mohebi Hair Restoration will provide a free one-night hotel stay along with transportation to and from the office. Simply call 888-302-8747 to schedule a free consultation with Dr. Mohebi or to receive more information. You need to secure the date of your procedure by $1000 deposit which is refundable if the request is made at least 14 days prior to the scheduled day for surgery. The remaining amount is due prior to procedure with the planned number of grafts. You will be charged only by the number of grafts that you receive. No. the charge of surgery covers all consultations; post op visits medications and devices. Are there any special Discounts on hair transplant procedures? We may have occasional discounts for all or a variety of our services. For more information on our special offers and promotions please contact our office at 1-888-302-8747. Promotional offers cannot be combined unless approved in advance by our office.